Sheiling is a traditional Scottish farmhouse dating back to the 1800s and extended around 20 years ago. The ground floor has a hall leading through to the study, and the sitting room, which has a bar and dining area, as well as a wood-burning stove and doors out to the terrace, and which comprises the new extension. The well-fitted kitchen lies to the rear of the house and there is a double bedroom off the hall on the ground floor. Upstairs are two further bedrooms and a shower room. Adjoining the house is a large garage/boathouse, which has a hobby room above. Outside, the grounds extend to around 0.88 acres to the high water mark which gives the property 60 metres of water frontage. The garden is mainly laid to lawn and there is direct access to the water with a slipway; the current owners have rented the jetty and a mooring through the Crown Estates. A boat is available by separate negotiation. 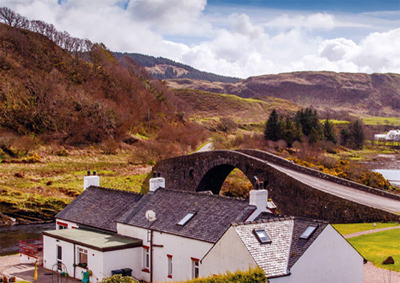 Sheiling occupies a wonderful location on the shores of the Seil Sound, adjacent to the Bridge over the Atlantic which connects the Isle of Seil to the mainland. Oban is just 11 miles away and the local area is a haven for wildlife including seals, otters, roe deer, seabirds and occasional eagles. Whales and basking sharks have been regularly seen in the water, which divers find is some of the clearest in the country. Oban has a range of shops and leisure facilities, while there is a rail station at Crianlarich. The guide price is £360,000. For further information please contact Knight Frank on 0131 222 9600 or visit www.knightfrank.co.uk.